From New York Timesand USA Today bestselling author Nan Rossiter comes a tender, moving story of rekindled passion, set amidst the timeless beauty of Nantucket. This book made me cry so hard! It is not your typical boy meets girl romance. It encompasses first love, heartbreak, forgiveness, unconditional love, and emotional loss. Real life issues, joys, and sadness are the core of this great story. The characters were amazing, I felt I could have been friends with all of them. The writing was good but I did feel it was a little drawn out in places. All in all a great read and one I would recommend to everyone. A story of loss, found love, lost love and finally love. It takes the reader through the life of a very talented boat builder and restorer whose life was upended when both of his parents were killed in an auto accident when he was very young. Taken on by an uncle in Nantucket he learns his boat building skills from a master. In his late teens he meets and falls in love with a wealthy young summer resident. That is followed by her father whisking her away, forbidding her to see her young lover again. Leaving him to deal with another loss, his story is continued until years later when the star-crossed lovers are reunited. I loved this book, never wanting to put it down. This is a great beach read. Beautiful characters, nice story. 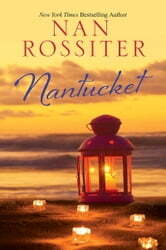 Makes you want to visit Cape Cod when you read Nan's books.